With all the health benefits of exercise, how can exercise be bad? It turns out that many resistance exercises, if not performed correctly, can cause injury. And, too much aerobic exercise can also be bad for you. As an example, one of the most extreme consequences of incorrect exercise is "rhabdomyolysis." Anyone -- at any age and at any fitness level -- can develop this if they exercise too strenuously for what they are used to. This can happen after a single exercise session. (see: "Exertional Rhabdomyolysis"). Listed below are some exercises to avoid. • Avoid This: Bent-Over Rows with a Barbell - Lifting weights while bent over at the waist is a great way to injure your lower back. • Do This Instead: Bent-Over Rows with a Single Dumbbell - Use a single dumbbell, not a barbell, so that you can exercise 1 side at a time. Place your free hand, and your knee on that side, on a bench. This way, your spine is supported like a table with 3 legs. • Avoid This: Leg Lifts With Straight Legs - I've always disliked this exercise. Some may think that leg-lifts are a good exercise to build core strength, however, the hip flexors are doing most of the work, just like the chains that lift a drawbridge. To lift the legs off the ground, the hip flexors pull against the pelvis. But, unlike the castle wall, the pelvis is not immobile. As the hip flexors contract, they pull against the pelvis, causing it to pivot. This puts strain on the lower back. This strain is exaggerated in people with long legs. • Do This Instead: Leg Lifts in a Frog Leg Position - While lying on your back, bend your knees and bring your heels up to your rear end. Now, point your knees outward, away from each other. You should now be in a frog leg position. If you do leg lifts with your legs in this position, you shift the effort from the hip flexors to the abdominals. Not only is this a better way to build core strength, it lessens strain on the low back. • Avoid This: The Plank - This is a motionless exercise where you hold your body horizontally off the ground supported by only your elbows and your toes. Stuart McGill, PhD, an international authority on rehab of the back, has shown that when the long, thin muscles of the back are held in a sustained contraction, they can be rapidly depleted of oxygen even when not contracting at their full tension (McGill SM, et al. 2000). The plank requires a very high contraction force in these muscles. (This is discussed in greater detail in: "Exercise and Back Pain.") Lack of oxygen delivery is not good for any tissue! And, when you consider that there really doesn't seem to be any benefit from doing planks, you can understand why I give it the "Dumbest Exercise Ever" award. • Do This Instead: Single Leg Extension While On Hands and Knees - Start by getting on your hands and knees. Then, lift one leg up and extend it behind you until it is straight. Both hands, and your other knee, are on still on the ground. According to Dr. McGill, this is a much safer way to exercise the long, thin muscles of the back (McGill SM. 2001). • Avoid This: Bench Dips (ie., placing the palms of your hands on a bench behind your back) - Doing a dip with your hands too far behind your torso over-extends the shoulder joint. Adding weights just makes it worse. • Do This Instead: Modified Push-Ups - Even when dips are done correctly (ie., on a set of parallel bars), dips are incredibly hard on the shoulder joint. Instead, do standard push-ups, but with your hands close together on the floor. • Avoid This: Torso Rotation While Seated - This is a weight-stack machine where you twist your upper torso while seated. Whenever your hips and your shoulders are not rotating in sync, you risk injuring your spine. • Do This Instead: Cable Cross-Over Chops - Using a cable machine with a high pulley, grab the handle with both hands. From a standing position, pull down, and diagonally, across your body by bending at the waist. Do not bend your elbows. You do not need much resistance to really work your abs and obliques! • Avoid This: Close-Grip Barbell Upright Row - This one is bad for your shoulder joint. Lifting a barbell from your belly to your neck with your hands close together can create an impingement on the rotator cuff muscles and tendons. Mike Robertson, CSCS, stated in Men's Health magazine that this is "absolute worst exercise" you can do. • Do This Instead: Wide-Grip Barbell Upright Row - Make sure your hands are at least shoulder-width apart on the barbell. • Avoid This: Too Much Weight - This one is bad for your low back if you load-up too much weight. The "easy chair" position of your hips and back in this type leg press machine causes the tailbone to curve too much as the weight is lowered all the way back down. • Do This Instead: Lunges, Squats, Step-Ups - Mike Mejia, CSCS, stated in Men's Health magazine that exercises like lunges, squats, and step-ups are better choices than this seated 45-degree leg press machine. Effects on the Skeleton: Men who regularly ran 20 miles/week had better bone density than those who ran less. But, this benefit was completely negated at distances of 60-75 miles per week (MacDougall JD, et al. 1992). Effects on the Heart: Recently, it has been suggested that long-term excessive endurance exercise can lead to myocardial fibrosis, coronary artery calcification, and malfunction of the contracting action of the heart (O'Keefe JH, et al. 2012). Effects on the Immune System: It is commonly reported that endurance athletes have a higher incidence of colds and upper respiratory illness. This is believed to be due to a suppressed immune system. Effects on the Endocrine System: When young female athletes lose enough weight and body fat so that their normal menstrual cycle is disrupted (amenorrhea), they are at risk of a decline in bone density. This is known as "female athlete triad" (Torstveit MK, et al. 2005). Cyclists and swimmers (Bellew JW, et al. 2006) who do not also include some type of impact exercise (see below) in their routine can have a decline in bone density. 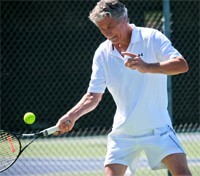 Even though their cardiovascular fitness is superb, the bone health of these athletes is worse than similarly-aged people who don't exercise as hard (Nichols JF, et al. 2003). THE SOLUTION: Include "impact" exercise. "Impact" exercise is a term I use to describe exercises or sports that involve jumping (eg., jumping jacks), or, change-in-direction running (eg., basketball, lacrosse, racquetball, soccer, squash, tennis, volleyball, etc). These activities produce an impact on the skeleton which causes it to flex. The amount of flexing is slight, but significant. This, in turn, stimulates bone to become stronger. Heavy weight-lifting causes blood pressure to skyrocket to astronomical levels. In one case, the blood pressure in the brachial artery of a weight-lifter hit 480/350 mmHg while he was performing a leg press! (MacDougall JD, et al. 1985). Even though these high pressures are very brief, when the vascular system is subjected to them over and over again, it is enough to cause a stiffening of the walls of the central arteries. In one study, the walls of the carotid arteries became stiffer after just 4 months of resistance training 3 times per week (Miyachi M, et al. 2004). In medical terms, this is called "decreased compliance" and it's not good. 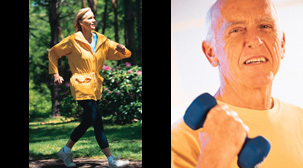 THE SOLUTION: Include aerobic exercise regularly in your exercise program. 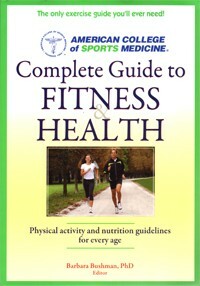 In 2011, ACSM published their "Complete Guide to Fitness & Health." This book is intended for consumers. It is a very thorough resource, and may be a bit too technical for some readers. However, it is very current and is backed up by solid science.